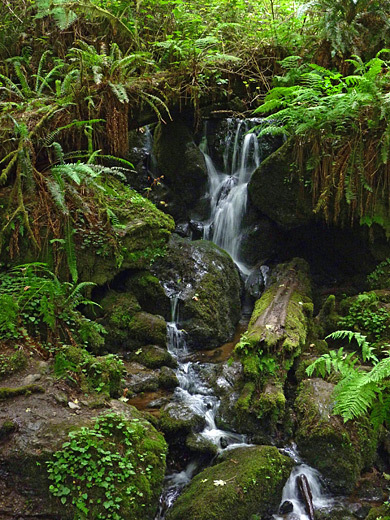 Probably the second most popular hike in Redwood National Park, after the Lady Bird Johnson Grove, is the 2.8 mile Trillium Falls Trail, looping through a band of undamaged, old growth redwoods on the west side of US 101, near the start of Davison Road to Fern Canyon and the Pacific Ocean. Most people just walk the first 0.3 miles to the waterfall, which is a rather small cascade on an unnamed creek, enclosed by ferns, moss-covered boulders and (in spring) white flowers of the western trillium, but the path continues beyond the stream through quite an impressive and atmospheric section of forest, only slightly affected by traffic noise from the highway below. 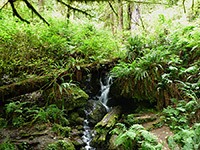 The belt of old redwoods is only a quarter of a mile wide, bordered to the east by meadows along US 101 and to the west by logged woodland of young replacement trees, yet most of the trail is all through dense forest, with no glimpses of the open lands at either side. 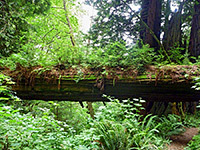 The environment is not so lush or peaceful as some other trails, especially those in Prairie Creek Redwoods State Park, but there are still many giant trees to admire. 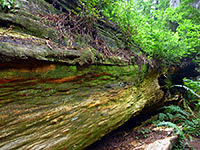 The surrounding area was extensively logged in the mid 20th century, and the trailhead for the hike is on the site of a former sawmill, removed in the 1960s when the national park was created. The trail starts 2.5 miles north of Orick at the large day use parking area a little way along Davison Road at the edge of Elk Meadow, the long, narrow grassland bordering US 101 that is indeed often home to a herd of elk. Two short paved paths lead southeastwards and connect with an old logging track which forms the first part of the route and also links back to the highway (a section known as the Davison Trail), but the Trillium Falls Trail soon forks off to the right, crossing a marshy, bushy area and entering the forest. 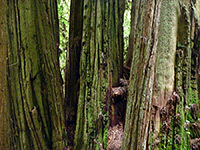 At first this is made up of a mix of thick undergrowth and regular trees, including alder, hazel and big leaf maple, but huge redwoods appear abruptly not far beyond. The path climbs 200 feet then flattens out, winding over a steeply sloping hillside and reaching the falls, crossing the creek via a metal footbridge that provides an ideal vantage point. Next are a few switchbacks taking the path higher up the hillside, followed by longer level or gently inclined stretches past rather smaller redwoods, before a short descent through a more overgrown area with lots of big-leaved plants, down to an intersection with another disused logging track, one that branches off the Davison Trail. This is a possible return route, but the Trillium Falls Trail continues on the far side, descending some more while still heading southwest, away from the trailhead. Before and after the crossing are many named redwood groves, some with commemorative benches; one is in memory of John B DeWitt, of the Save the Redwoods League. 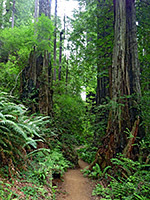 The path eventually bends round back northeast, through forest that still contains plenty of big redwoods, mixed with quite a few burnt stumps and trunks, and is crossed by several tiny creeks. US 101 is quite close now, so vehicle noise is more of a distraction. 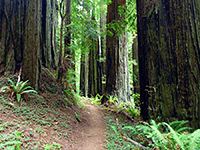 The redwoods fade away as the trail nears the east edge of the forest, and rises to meet the forest track once more, from where the trailhead is half a mile further.